The 90-degree angle of this adapter allows you to reposition the HDMI jack for better access where space is tight. This adapter also offers a great way to protect your HDMI cables and equipment from strain and damage, since HDMI cables have relatively small connectors and jacks that must bear the brunt of the cable’s weight. The plug-and-play design makes installation a breeze. The P142-000-UP Right Angle HDMI Adapter features gold-plated connectors for optimal signal transmission quality. Provides clean, uncompressed digital signals. Supports video resolution up to 1080p. Ver 1.3 and 1.4 compliant. 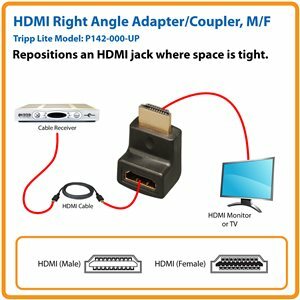 Tripp Lite’s P142-000-UP features a 90-degree upward angle that allows you to reposition an HDMI jack for better access where space is tight. You can use it in tight spaces where cables don’t fit, saving wear and tear on equipment ports and cable ends, or to more easily hide cables from view. This adapter is 1 in. deep when plugged into the HDMI port. The P142-000-UP features gold-plated connectors for optimal signal transmission quality and clean, uncompressed digital signals. It supports v1.4, 1080p, 1080i and 720p. It’s plug-and-play ready, so installation is a breeze. For peace of mind, this adapter comes backed by a lifetime warranty. Accept no substitutes! Your Tripp Lite adapter will be shipped to you in its original Tripp Lite packaging (poly bag with Tripp Lite logo; see photo). This is your assurance that the cable you purchase will deliver the superior performance you expect. If you don’t see this packaging, it’s not a genuine Tripp Lite product. The P142-000-UP is also manufactured in compliance with strict RoHS specifications, reflecting Tripp Lite’s commitment to environmental responsibility.